Strengthening our leadership position in immunoassays, Enzo Life Sciences now offers Amp'd™ GLP-1 ELISA Kit – a rapid ELISA for the detection of the active form of Glucagon-Like Peptide 1. GLP-1 functions in the regulation of blood glucose through insulin, and plays a role in obesity and diabetes. It is the most potent promoter of insulin secretion and an important gastrointestinal peptide hormone, or incretin. In response to eating, increased levels of GLP-1 stimulate insulin secretion and inhibit glucagon release leading to lower blood glucose levels. These positive effects of GLP-1 on glucose regulation make it an important target for the management of type 2 diabetes and the study of obesity. The Amp'd™ GLP-1 ELISA Kit can be used to quantify the active form of human GLP-1 in serum and plasma samples. This sensitive assay is fully quantitative, with the ability to detect as low as 5.5 pg/ml of Glucagon-like peptide 1 (7-36) amide, surpassing semi-quantitative Western blot analysis. This assay produces rapid results in just under 3 hours with negligible reactivity to similar family members (GLP-1 (7-37), GLP-1 (9-36) amide, GLP-1 (1-36) amide, GLP-2, Glucagon). 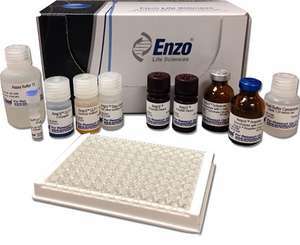 With this new kit, Enzo Life Sciences extends our line of sensitive Amp’d ELISA kits, which includes the Amp’d HSP70 High Sensitivity Kit. Amp’d ELISA kits employ a novel signal enhancing step to amplify low signal for increased sensitivity. For more information, or to order the Amp’d™ GLP-1 ELISA Kit or other Enzo Life Sciences products, please visit us at www.enzolifesciences.com or call us at 1-800-942-0430.